On a recent trip to Kansas for a friend’s wedding, I came to the realization that airplane food is just never going to do it for me. There are rarely any good vegetarian options that aren’t slathered in five kinds of cheese, and there’s hardly ever a fresh vegetable in sight. OK, rant over. The solution? Bring your own lunch! And so I did. This recipe is inspired by my simple airplane salad that requires just 30 minutes to make, and it’s insanely healthy and delicious. Let’s do it! The base of this salad is organic spinach and mizuna lettuce from our organic CSA! However, you can use whatever greens you have on hand. I think kale and green lettuce would also work well. Next comes sweet potatoes that are roasted until tender and golden brown, as well as a ripe avocado for plenty of plant-based fiber and healthy fat. Lastly? The dressing! 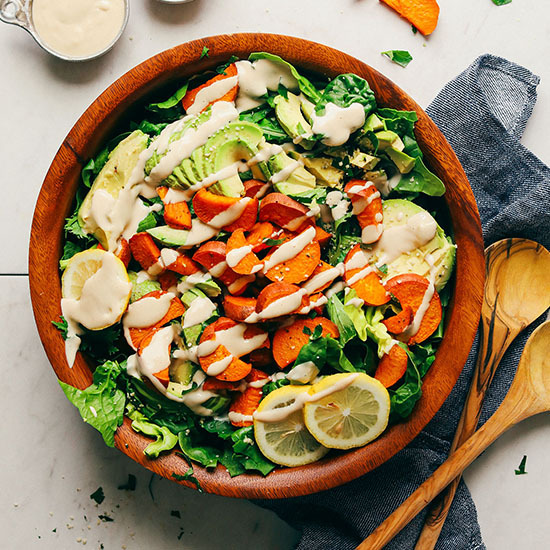 It’s all about the dressing, which is my go-to 3-ingredient lemon-maple tahini dressing! It’s creamy, citrusy, and subtly sweet, and it complements this salad perfectly. That’s really it! It’s light and refreshing yet satisfying. For added protein, I sprinkled on a healthy dose of hemp seeds, which are a “perfect protein” and contain all 20 amino acids (among other amazing health benefits). Can we say superfood much? However, you can also add something like crispy baked chickpeas for added protein and fiber. This makes a perfect portable lunch, as it can be served chilled or at room temperature (making it ideal for long flights!). It’s delicious on its own and serves one as an entrée (with 22+ g protein!). And it would also make a delicious side to mains like my Grillable Veggie Burger, Chickpea Bolognese, or 8-Ingredient Zucchini Lasagna! If you try this recipe, let us know! Leave a comment, rate it, and tag a photo #minimalistbaker on Instagram so we can see what you come up with. Cheers, friends! 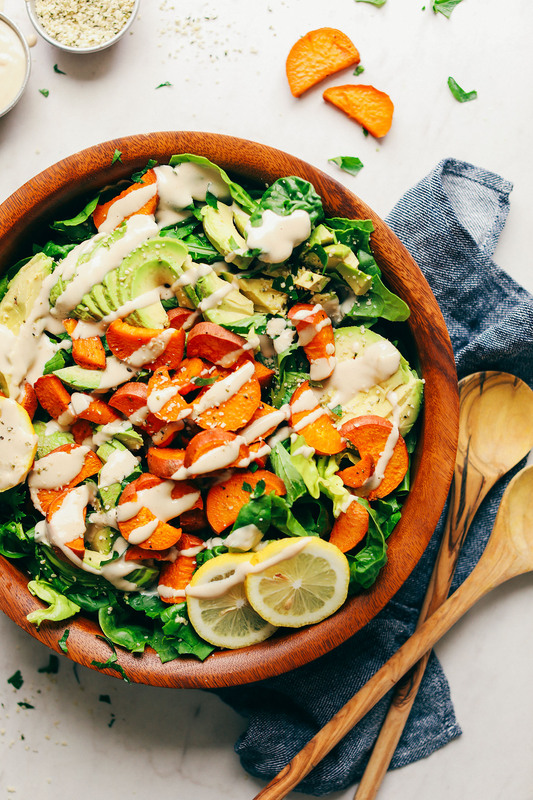 A simple yet flavorful and satisfying salad with organic greens, roasted sweet potato, creamy avocado, and a lemon-maple tahini dressing. 30 minutes, naturally sweetened, so delicious! Preheat oven to 375 degrees F (190 C) and line a baking sheet with parchment paper (as original recipe is written // use more baking sheets if making a larger batch). Add sweet potatoes, toss in a bit of oil (or water) and salt, and spread into an even layer. Bake 15 minutes. Then flip/toss to ensure even baking. Bake 5-10 minutes more or until tender and golden brown. 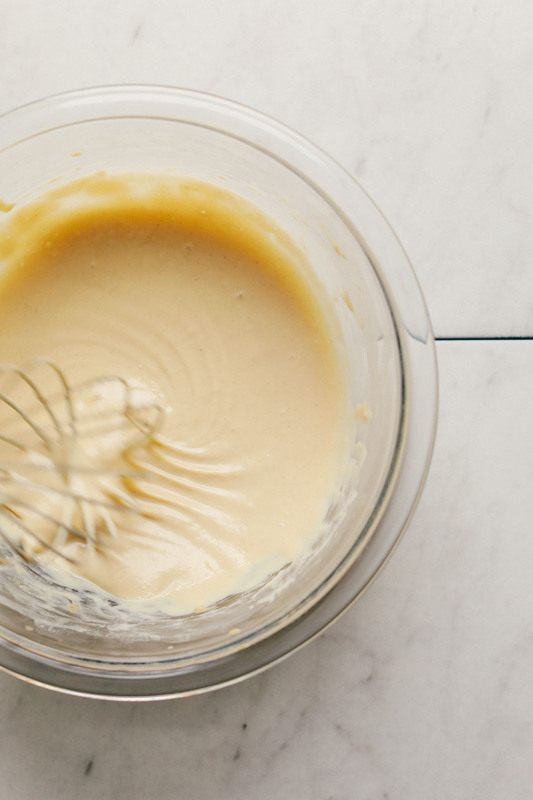 In the meantime, prepare dressing by adding tahini, lemon juice, maple syrup, and salt to a small mixing bowl. Whisk to combine. Then add water a little at a time until a semi-thick, pourable dressing is achieved. Taste and adjust flavor as needed, adding more lemon for acidity, salt for saltiness, or maple syrup for sweetness. Set aside. 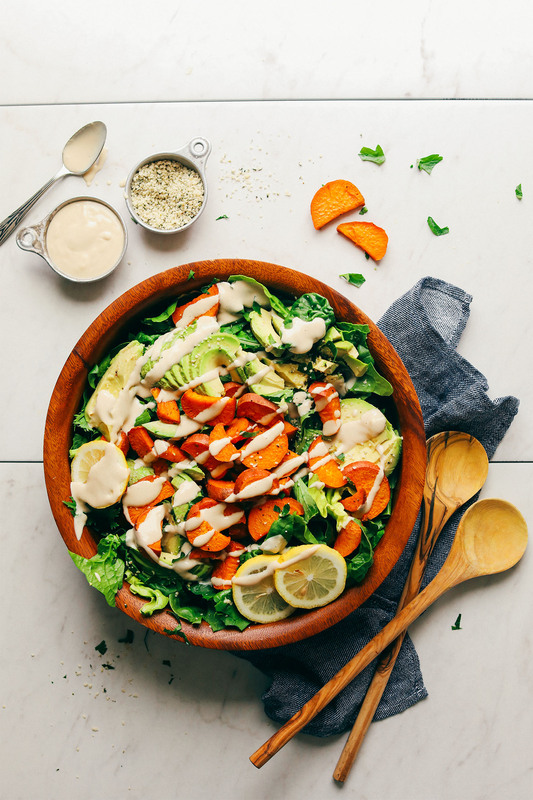 Assemble salad by adding greens to a serving bowl and topping with roasted sweet potato and avocado. Sprinkle on hemp seeds (optional), and serve with dressing. Leftovers keep (stored separately) in the refrigerator up to 3 days. Dressing will stay for 5-7 days. *Nutrition information is a rough estimate calculated with all of the dressing and hemp seeds. I just want to give you a general love letter. I was so desperate to be such a bad cook for many years but here I am now: not-so-terrible! After following your recipes for the last 2 years, I have actually improved. I have been hosting friends who now ask me how I did it and what’s the recipe? Minimalist Baker: Dana! Your simple recipes have taught me a lot and given me so much confidence. I really feel you’ve been a part of this “becoming”. I’ve tried so many other recipes, so many blogs and always managed to ruin everything. I never could understand why and I just couldn’t see where to start. I also never used to understand in American or English cups and measuring systems, I always got confused somewhere womehow and ended up with dinners that were absolutely toxic! The simple fact that you’ve integrated the “metric” option shows such an attention to details and dedication. So yes. I’m (for the first time) posting a comment, because of a strange reaction I’ve just had really. What just happened is a realisation that baby-step by baby-step I’m getting better and that’s all thanks to you! So thank you for being part of my routine and as my cooking education! Please keep on making beautiful recipes and photographs, sharing your words, ideas and exciting our “papilles”! I love tahini, lemon and sweet potato, and the combination of flavors worked perfectly (next time I will skip the maple syrup). We used avocado oil for the sweet potatoes, and mix of lettuce and baby spinach. Added to my list of favorites! The flavors in this recipe work so well together! I needed a comforting food hug on this cold, damp winter night and this salad was exactly that. 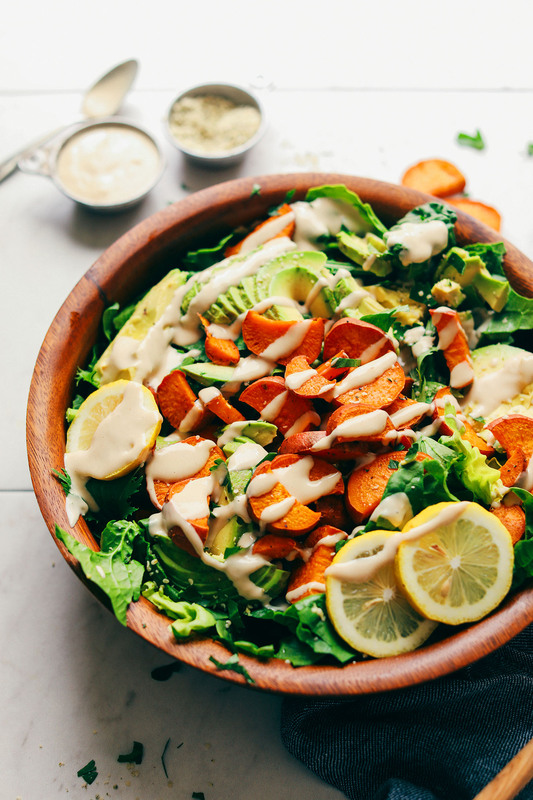 The roasted sweet potatoes and avocado are highlighted perfectly with the lemon tahini dressing. I stuck to the recipe exactly and now I dare someone to try to get to the leftovers before me tomorrow! This delicious dish was surprisingly filling enough to stand alone for dinner for us! I used water for the sweet potato instead of oil for the first time, and it worked out well. I wouldn’t do it for say, sweet potato fries, but in a dish with a sauce and other things it works. I added in some fresh summer oven-roasted corn. Two small ears for two, with a drizzle of oil and a dash of smoked paprika, tossed in a bowl to coat, then baked on a tray until as crisp as you like! I made the recipe as-is and found the dressing so bitter as to be inedible. I’ve read that tahini can taste different depending on the type of sesame seeds use. Perhaps I had one with a particularly bitter sesame seed? Perhaps yes. The dressing shouldn’t have been so bitter. Either you added too much lemon or the tahini wasn’t great quality. I have had some more bitter tahini in the paat. Now I am trying Artisana brand, and I find it not bitter, almost sweet which is nice. Always love your recipes. They’re always so good! Question for you: what would you use instead of citrus? (That and tomato causing my gorg 13yo dermatitis on the face ? ?‍♀️) many thanks. Hi Carmel! You could try using vinegar, but I would cut the amount in half! Wow you’ve done it again!!!! This salad is amazing!!!! I have yet to be disappointed by one of your recipes! This has just the right combination of flavors and textures! Hey so I love the idea of bringing this along for a flight. I’m traveling to Australia next week so this will be an awesome meal along the way. Did you put the dressing on ahead of time or bring it separately? This doesn’t count as a liquid? Looked deliciious but the dressing was not good at all. Sorry to say. Not my fav. Threw the dressing in the vitamix, added some tomato and tamari. Was much better after. Felt like the sallad and dressing was missing something. Will not make again. Loved everything about this! Simple, easy, tasty – adding this to the regular rotation for sure. Another incredible recipe – thank you Dana! Hi! You can leave it out, it already has 22g of protein! I made this for lunch today for my entire family (with sunflower seed instead of tahini because we have a sesame allergy ? )my husband and I loved it!! The kids could eat it with minimal complaining!! Everything I make from you is delicious!! EVERYTHING! Thank you! You will never know the peace you have helped me find in the kitchen. God bless you! I have fallen in love with your tahini dressing, It has become one of my staples. So much so, that I go through it rather quickly. I have been buying the organic Whole Foods brand, but was wondering if you had any other tahini suggestions? Perhaps one that comes in a larger quantity that isn’t too pricy? If you have a Mediterranean market around you, check there. I get a tub of it for half the price of grocery store/organic brands. I know it’s late, but I hope it’s helpful. I always do a massaged kale salad for traveling- the sturdy greens hold up well and get softer and more tasty after a few hours. I make it the night before if i have an early departure. Adding roasted sweet potatoes is a fantastic idea! My standard additions include some crumbled or chopped tempeh (sautéed with a splash of oil and soy sauce) and then just whatever veggies i need to use up and a good handful of nuts or seeds instead of avocado since that turns brown quickly which weirds me out somehow. I always always bring my own food for planes! Although i have to say that i did eat my meal on Korean Air- nyc to Seoul in business class- they serve wonderful little banchan and then i asked for the bibimbap without the omni protein (which makes it vegan) and it was excellent with a nice assortment of marinated bean sprouts, mushrooms, greens, sesame seeds, shredded radish…. obviously an unusual exception! I was doubtful about this, but it was so delicious and I ended up scraping the rest of the dressing out of the measuring cup. It only needed salt and pepper. Next time am trying roasted sunflower seeds though. If I were going to take it on a trip, I’d leave the avocado pit attached so it doesn’t turn brown. Thank you so much, from a newly-vegan, newly-diagnosed allergic-to-dairy person!! I am getting a lot out of your recipes and website. Looks delicious!Interesting that you’ve left the skin on the sweet potatoes. Unlike a regular potato, the skin of which I devour, the sweet potato skin always seemed a bit thick to me, so I’ve never eaten it! And it always separates from the baked sweet potato somewhat. But looks like in the picture it doesn’t! 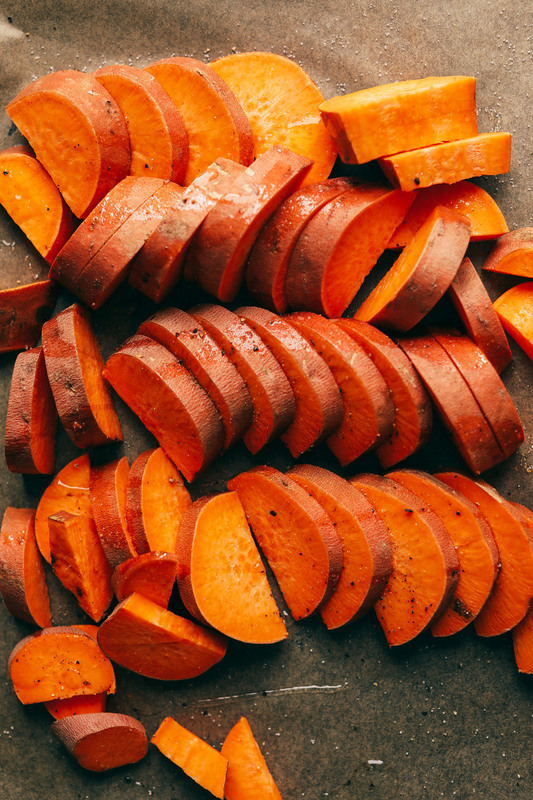 It’s hot now–can I boil the sweet potatoes instead of baking them? Made This Last Night for the win! It’s definitely something I’ll make on a regular bases. One of those rare recipes that lives up to everything you want and need it to be. Delicious and simple to make on what was a late work night and will inspire me to make sure I have sweet potatoes on hand! I made this yesterday using butter lettuce and it was DELICIOUS! The dressing is phenomenal! I have made quite a few of your recipes and they are ALWAYS amazing, but this one was just so easy to put together and so delicious I had to leave a comment! I’m curious about the option to toss the sweet potatoes in oil or water. Would water be enough to keep them from sticking? If cooked on parchment paper, yes! This looks amazing, but I don’t think anyone ever talks about your AMAZING drizzle skills! Girl, you’re rocking it! Yes! Sweet potato and avocado are 2 of my all time favourite foods! This recipe looks really good and filling. I’ll give it a try next week. And how did you get the meal on the flight, I always assumed I couldn’t bring outside food on (except when I took a bag of almonds in my backpack). Here I thought I was subtle when in reality I could bring them with no problem. As long as there is no liquid / cream they let me through with food, which I pack in a plastic to-go container and a freezer bag to catch any drips. Never had a problem in security! Dana! This looks amazing, as always. Your tahini sauce sounds so so so yummy! & I love that you justify salad for breakfast – something only a genius like you could do. Looks delicious and I know my seven-year old will love it. I can see now I’ve been roasting my sweet potato slices at too high a temp (no wonder they burn). …Can’t believe you actually got a meal on a flight, let alone one between here and Kansas, tho. Going to try this soon but was wondering about adding a spice to the dressing….what would you suggest? Dill? I think that would be awesome! Also chives might work! I’ve been following your page for a bit now and I love all the recipes I have tried. Quick question, is there another dressing that you think would go well with this? I’ve been trying to like tahini, but I really don’t care for it and the taste always seems to stand out. Hi Rebecca! No worries. I think my Chimichurri sauce would go lovely with this, as would my Vegan Caesar Dressing, and Cilantro Avocado Dressing! Sometimes the simple things in life can bring us the most joy! Looks like a lovely salad, can’t wait to make this one! Of course! And I save the to=go container, wash it at the hotel, and grab another salad at the grocery store for my trip home! Made this for lunch today, and it was delicious! Thanks for another great recipe Dana!